When his parents send him to summer camp for the first time, Ethan has just three modest goals. First, to survive. Second, not to be hated. Third, not to be the worst at anything. But soon he finds his real challenge comes in the form of a new cabin mate, Zach. This contest is open to residents of North America (excluding Quebec). We will accept entries until midnight on Sunday, June 7, and will contact the winner by email on Monday, June 8th. I just received the first two author copies of my new picture book, Bright Sky, Starry City, published by the lovely people at Groundwood and illustrated by the talented Aimee Sicuro. is there anything quite like opening a package and finding a new book? All right, I’m not going into the usual rant about the lack of tactility in an e-book, or how the heck we think kids are going to love books if they can’t hug them or smell them or chew on them or even what’s going to happen to bodies and brains if a backlit screen becomes the primary source of text and image. Instead, let us consider endpapers. Look at these. Sidewalk chalk and sky, child mind and universe — it’s all in here. Are these endpapers not the perfect introduction to a book on dark skies and a child’s vast, reaching imagination? The picture-book writer is only the owner of the book in a kind of curatorial way. You start the thing off with an idea that has you in its grip. You try to give it shape. You plunk some words down on the page. If the thing holds up (and many picture-book ideas do not) you keep going. If you can get enough of the vision down so it makes sense to others, well then a publisher might pick it up and assign it to an illustrator. The illustrator gets to work, without my word-bound oversight, for which praise be. In this case, I got to check facts. I suggested a few research sources. I asked a consultant to comment on the accuracy of both text and images. Some text changed as the images grew. But the endpapers? They were a complete surprise. They ensure that the story of the book begins in the child reader’s mind before even a single page gets turned. What a gift! Uma’s post inspired us to share some of our favorite end papers. Click on any of the images below to see what book the are from! Phoebe helps her dad set up telescopes on the sidewalk outside his store. It’s a special night — Saturn and Mars are going to appear together in the sky. But will Phoebe be able to see them with all the city lights? Raindrops begin to fall, followed by lightning and thunder. Phoebe is filled with disappointment as she and her father hurry inside to wait out the storm. Take the Mosquito Brothers Quiz! Abukacha finally throws away his worn out shoes and gets himself a new pair. But the old shoes, somehow, keep finding their way back to him. When author and illustrator Tamar Tessler was a little girl, her aunt would tell her the story of Abukacha and his shoes — a story that had been told to her by her own Polish aunt, Fella. The plot was always different, but the problem remained the same — Abukacha had the biggest shoes in the world, and he couldn’t get rid of them no matter what he did. Inspired by her husband, who refused to throw away a worn-out pair of shoes, Tamar wrote her own version of the story, and created art that incorporates her cherished family photos. Draw a Cat with Qin Leng! Qin Leng lives and works as a designer and illustrator in Toronto. She graduated from the Mel Hoppenheim School of Cinema and has received many awards for her animated short films and artwork. She has published numerous picture books in Canada, the United Kingdom, the United States, France, Sweden, Hong Kong, and South Korea. She has also illustrated for Save the Children and UNICEF. Her newest book is Song For a Summer Night, written by Robert Heidbreder. This weekend the Groundwood crew and some of our creators will be at the Toronto Comics Arts Festival. 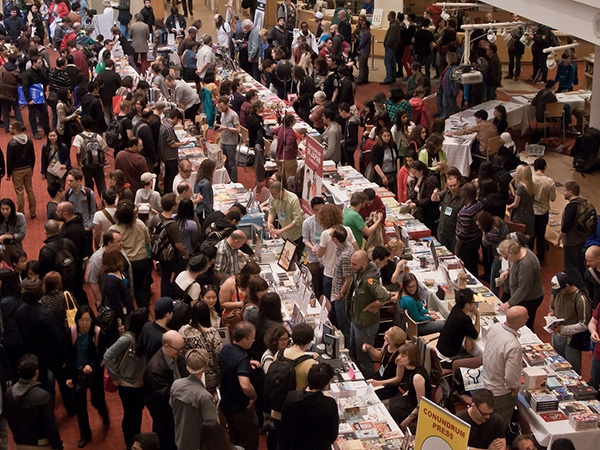 TCAF is a week-long celebration of comics and graphic novels and their creators, which culminates in a two-day exhibition and vendor fair featuring hundreds of comics creators from around the world. Other festival events include readings, interviews, panels, workshops, gallery shows, art installations and much more. In 2003, TCAF’s first year, 600 members of the public attended. Last year, just over a decade later, 22,000 people filed through the Toronto Reference Library to meet their favorite artists. If you can’t be in Toronto this weekend, there’s no reason why you can’t celebrate comics too. That’s why Willow Dawson (illustrator of Avis Dolphin) made a special printable workbook just for you! Click on the cover to download it. We have lots of downloadable goodies on our website for parents, teachers, and librarians. Check out all our downloadables here. Come See Us at TCAF! If you’re lucky enough to be among the throng at the Toronto Comic Arts Festival this weekend, make sure to swing by booth #140. We’ll have all sorts of books, posters and buttons for your collections, and authors and illustrators will be signing at our booth all weekend long. It has been suggested that crokinole is the secret star (thank you, Carolyn!) of The Tweedles Go Online. The vintage board game keeps the Tweedle family entertained and happy in each other’s company. It also, ultimately, restores the peace. Can one ask for more from a tabletop parlour game? The year is 1903, and the good-natured Tweedles are bound and determined to follow the inventive trends of the day. When not tooling around in their electric car (see The Tweedles Go Electric), they are engaged in a boisterous (and somewhat newly invented) game called “crokinole.” Eckhardt Wettlaufer, of Sebastopol, Ontario, devised the game in 1876. It was likely named after a crunchy French cookie, croquignole, and was once one of the most popular game in North America! How do you play crokinole? The game centers on a wooden board with a hole in the middle and discs that each player must flick into the centre hole while trying to displace the other players’ discs. Attaining any level of proficiency requires tremendous eye-hand coordination and a gentle touch — skills young Franny clearly possesses, but Mama does not. Monica Kulling is the author of over forty books for children, including The Tweedles Go Electric and The Tweedles Go Online as well as the popular Great Idea series, stories of inventors. Going Up! Elisha Otis’s Trip to the Top, the fourth in the series, was a finalist for the 2013 Norma Fleck Non-Fiction Award. Monica Kulling lives in Toronto, Canada. Visit her at www.monicakulling.com.